Was easy to follow and did not feel like I was missing anything during the process. 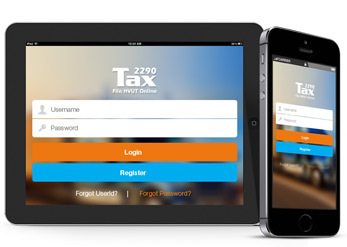 Tax2290 app is free to download in an iOS devices and complete your 2290 tax e-filing from anywhere any time. tax2290.com the fastest and the easiest way to e-file IRS Form 2290 online on the web and is now available for your smart phone or device simply download the app and experience the difference. It’s 100% Safe and 100% Secured as it is from ThinkTrade, Inc.
We've completely overhauled your favorite Tax2290 app to match the iOS 7 experience; the new look app brings you native iOS 7 animations, faster transitions and quick response. The screens are designed for giving you a seamless and great experience. Tax2290 iOS app is now available in iTunes download yours for FREE and start using it to e-file your Heavy Vehicle Use Taxes online. Tax2290 iOS App is supported in iPhone and iPad devices from Apple. Tax2290 Android App is free to download for every smart phone users and try e-filing the IRS Tax Form 2290. Tax2290.com the fastest and the easiest way to e-file IRS Form 2290 online on the web and now from your phone or tablet, It’s Secured as it is from ThinkTrade, Inc. Enjoy the world's most powerful mobile platform with Tax2290 Android App and it is now available at Google Play store. E-file from wherever you are. Android is from Google and stated that there's no other software quite like Android for Mobile. Tax 2290 Personalized Chrome experience! Browse fast on your Android phone or tablet with Chrome. Bring your personalized Chrome experience with you anywhere you go. Tax 2290 has its own Chrome Extension, Browser App and Theme. We could not wait anymore to facilitate our customer’s convenience with more, and so we launched the mobile version of our ever-safe form 2290 e-file application. Tax2290 mobile app to easily file IRS Tax Form 2290 (online filing), is compatible with iPhone, iPad, Android, Blackberry & other devices. Tax2290 mobile app is widely rated as the best to file IRS Tax Form 2290 (online filing), from your iPhone, iPad, Android, Blackberry & other devices. For you truck owner operators who are mostly on roads, handy amenities are always a boon. Just like the sight of a good quality truck stop when you think of resting or an unclogged roadway when you have to make an important time-tight delivery. The mobile version of tax2290.com (compatible with iPhone, iPad, Android, Blackberry & other devices) which has been brought to life as a diagnosis of the importance of your time is sure to refresh your mind every time you file your tax form. You can easily file your form 2290 from anywhere, anytime on simplified screens and get your stamped schedule 1 copy at a great response speed. So take advantage of mobile e-filing of HVUT and get your schedule 1 copy wherever you are! That’s why Tax2290 mobile app is widely rated as the best to file IRS Tax Form 2290 (online filing), from your iPhone, iPad, Android, Blackberry & other devices. 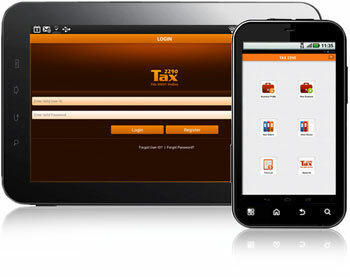 Just access m.tax2290.com from your mobile and start using the mobile version of Tax2290 to e-file your 2290 taxes (compatible with iPhone, iPad, Android, Blackberry & other devices). Not register with us? Simply tap on Sign-In and register yourself and start using it to e-file in no time. m.tax2290.com a new initiative for the 2290 tax filers on the move, and we are currently working with 2290 apps to make it more accessible and specific to the mobile platforms. Our File Form 2290 Mobile App is compatible with iPhone, iPad, Android, Blackberry & other devices. Tax2290 mobile app is widely rated as the best to file IRS Tax Form 2290 (online filing), from your iPhone, iPad, Android, Blackberry & other devices. You can e-file 2290 taxes using your mobile, for unlimited vehicles. That’s why Tax2290 mobile app is widely rated as the best to file IRS Tax Form 2290 (online filing), from your iPhone, iPad, Android, Blackberry & other devices. If you wish to file Form 2290 (online filing) from your iPhone, iPad, Android, Blackberry & other devices, you have certainly come to the right place. Tax2290 mobile app is widely rated as the best to file IRS Tax Form 2290 (online filing), from your iPhone, iPad, Android, Blackberry & other devices. 866-245-3918 and support@taxexcise.com no matter when. Tax2290 mobile app is widely rated as the best to file IRS Tax Form 2290 (online filing), from your iPhone, iPad, Android, Blackberry ,..
About Us: Easily file Form 2290 (online filing) from your iPhone, iPad, Android, Blackberry & other devices … only at Tax2290.com. Tax2290.com is an IRS certified and verified service provider to safely file IRS Tax Form 2290 (online filing) from your iPhone, iPad, Android, Blackberry & other devices. Tax2290 mobile app to file IRS Tax Form 2290 (online filing), is compatible with iPhone, iPad, Android, Blackberry & other devices. Tax2290 mobile app is widely rated as the best to file IRS Tax Form 2290 (online filing), from your iPhone, iPad, Android, Blackberry & other devices. We are here to help if you have any questions regarding filing IRS Tax Form 2290 online.